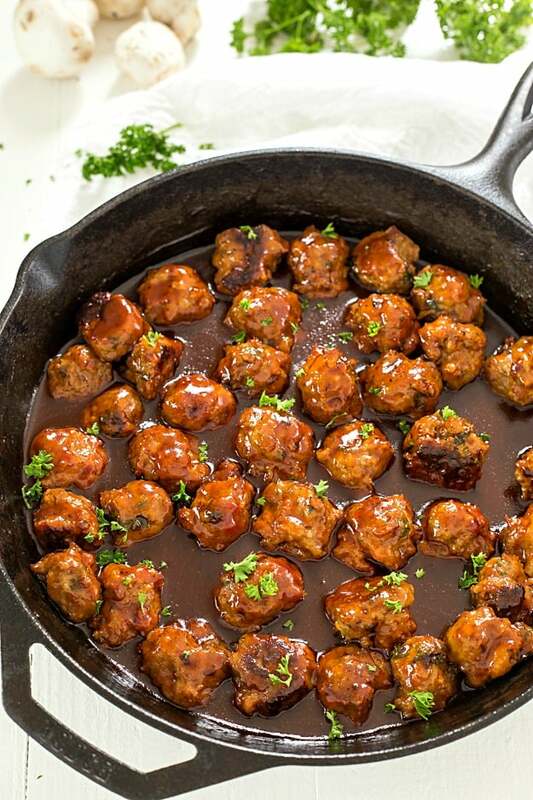 Bacon Honey Bourbon Chicken Meatballs – These meatballs are so easy and bake to perfection, and then simmer in an out-of-this-world honey bourbon barbecue sauce! Perfect as an appetizer or to serve on sandwiches! Meatballs are always a perfect appetizer to serve at a party or even for dinner for two or three. These meatballs are so versatile. We love adding a vegetable or two to make it a complete meal. I always tell everyone there are the two B’s you cannot forget to add to your meatballs to make them stand out. Any guesses to what they are? Bacon and bourbon! Don’t forget to keep a little bourbon on the side for the cook. You deserve it! There’s also another flavor component in these meatballs they make them so juicy and tasty. Can’t reveal that ingredient, just yet. 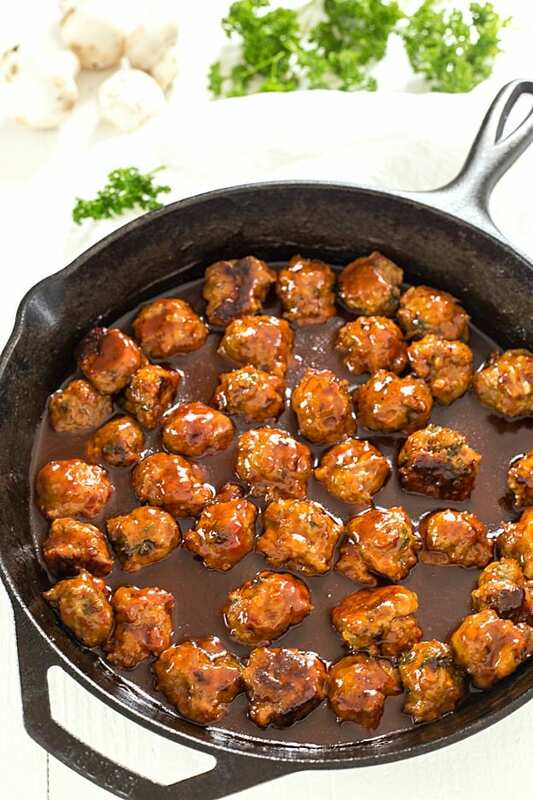 If you are looking for a game day appetizer, appetizer for a party, or even to bring to your upcoming potlucks and BBQ’s, then these bacon honey bourbon chicken meatballs are for you! They are simple to make, and the sauce is out of this world! 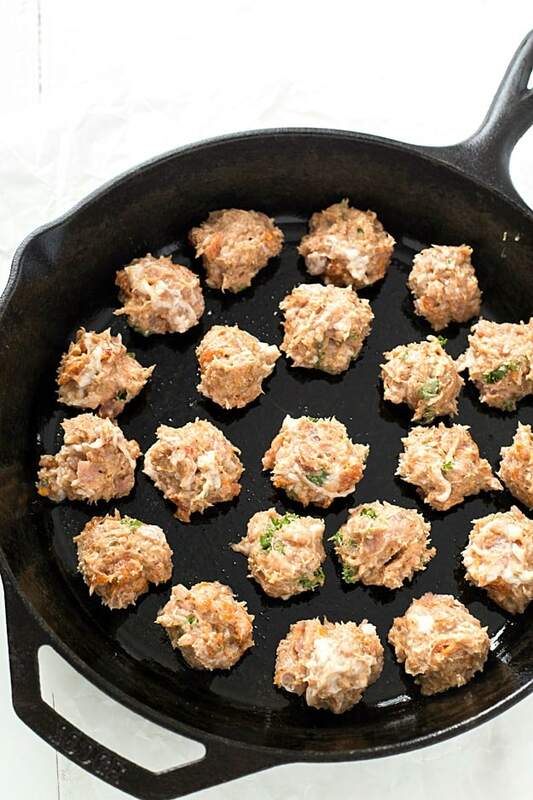 Let’s start with how the flavors come together in these chicken meatballs. I added off by pulsing bacon, button mushrooms, and onions together in my food processor. Oh, I’m so glad you asked! The blended mushrooms add a lot of flavor and can easily mimic meat, just remember to blend/pulse them to match the consistency of your meat mixture. Not only do the mushrooms add flavor, but you also get an extra serving of vegetables, which is always a winner in our house! We love how they are fat-free, cholesterol-free, low in calories, and provide many nutrients. Once you have your blend combined, you will add it to your ground chicken and hot Italian sausage, plus seasonings and spices, and then lastly adding breadcrumbs. The consistency of these meatballs is a little different than ground beef meatballs. They are a little stickier and moister. I highly recommend using a medium-sized cookie scoop; it makes scooping them into your skillet or baking sheet so much easier! Click here to learn even more about The Blend. 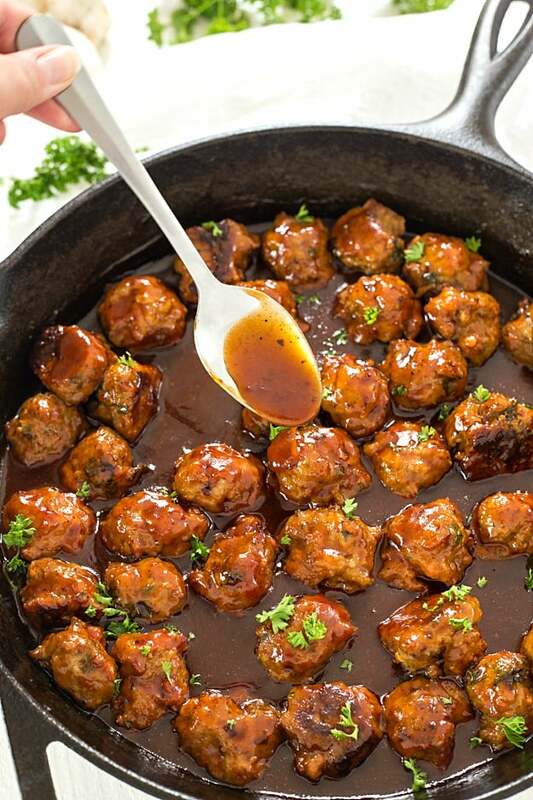 Bacon Honey Bourbon Chicken Meatballs - These meatballs are so easy and bake to perfection, and then simmer in an out-of-this-world honey bourbon barbecue sauce! Perfect as an appetizer or to serve on sandwiches! Preheat oven to 400 degrees. Line a baking sheet with aluminum and spray with non-stick cooking spray or grease a large skillet. Set aside. Pulse together the bacon and button mushrooms until blended. Place the mushroom and bacon mixture, ground chicken, and hot Italian sausage, salt, pepper, chili powder, and garlic, and breadcrumbs into a medium mixing bowl and mix until combined. Scoop the meat mixture using a medium cookie scoop and place onto the baking sheet or in the skillet. Repeat until all of the meat has been used. Whisk together the water, barbecue sauce, bourbon, and honey in a large skillet. Simmer over medium heat for 5 minutes, add the cooked meatballs to the sauce, coat each meatball, and simmer over low-to-medium heat for 15 minutes or until the sauce has thickened. Note 1: You may substitute ½ teaspoon of dried basil for fresh basil. Thank you! This recipe is so delicious I had to make again for another holiday party. I should have taken a picture of my uncles face when he repeatedly told me how good they were :-). I used nitrate/nitrite free bacon & sausage due to allergies & amazing still! Many thanks!